Munising’s Living Room is For Sale! We have decided to sell the Falling Rock Cafe & Bookstore, along with the building located at 104 East Munising Avenue. It has been a wonderful 15 years and we are in no particular hurry, but believe it’s time for us to consider alternatives for insuring the sustainability of the business and its impact on the community. 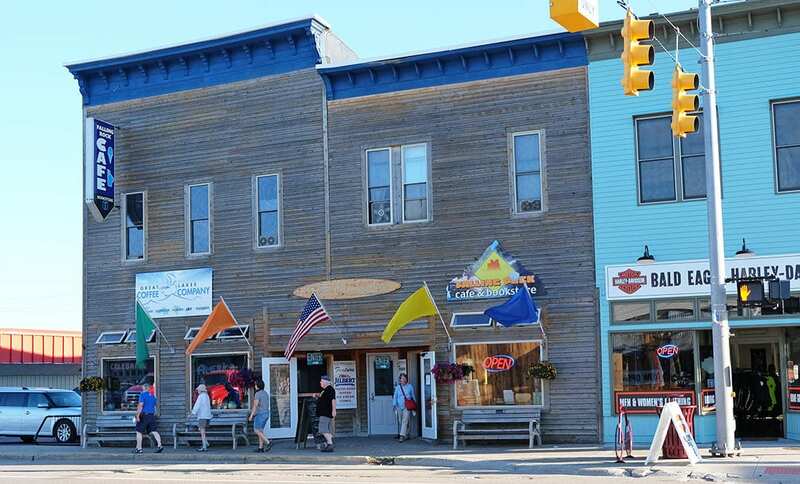 Own your own business in the quaint Upper Peninsula town of Munising, Michigan overlooking the Pictured Rocks National Lakeshore with access to Lake Superior. This is the perfect spot near many popular businesses and tourist attractions along the main street in downtown Munising. This remodeled retail space is open and spacious with completely updated electricity, heat, water, sewer and additional infrastructure. Located in the historic 104 E. Munising Avenue building along the shores of Lake Superior, our building was built in 1896, the year that the City of Munising was incorporated. We have uncovered the tin wall panels, wainscots and the original maple floors, and have restored the walls and floors to their former beauty. Visit our History Page to learn more about the building. Munising is about 5 hours from Milwaukee and Madison, and a 6.5 hour drive from Chicago, Detroit and the Twin Cities. The area is served by Sawyer international Airport, which is 45 minutes away. Delta and American Airlines provide daily service. The Munising area boasts some the best outdoor recreation opportunities and most expansive and wilderness-integrated mountain biking trails in the country, and is home to the annual Michigan Ice Fest, the UP200 and Midnight Run Sled Dog Races, and the nearby Noquemanon Ski Marathon in the vibrant city of Marquette. Local summer activities include hiking the various trails of Pictured Rocks National Lakeshore, exploring the numerous waterfalls, and both inland and big lake fishing. You can sail on Lake Superior, or explore the many islands by boat or jet ski. 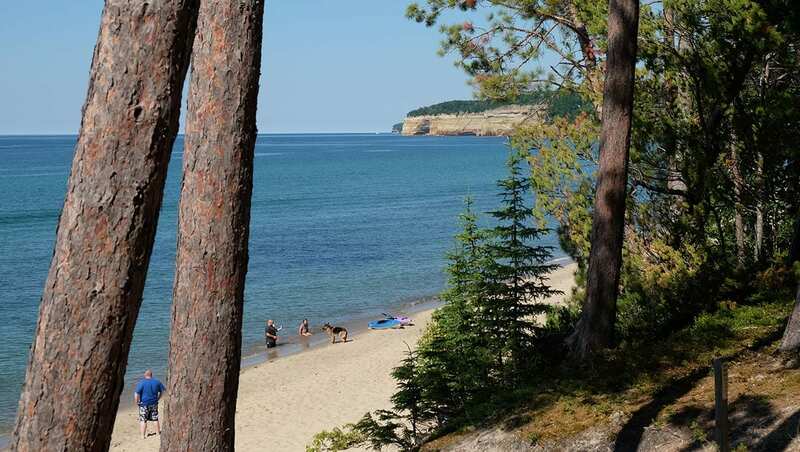 Nearby Marquette is host to many summer music and art festivals along the breezy shores of Lake Superior including Hiawatha Music Festival, Forestville, and Art on the Rocks. In winter, 40 minutes away is Marquette Mountain, the local ski hill that gets lots of lake effect snow. This area has snow when many of the areas of the country do not. There are endless snowmobile and cross country ski trails was well. 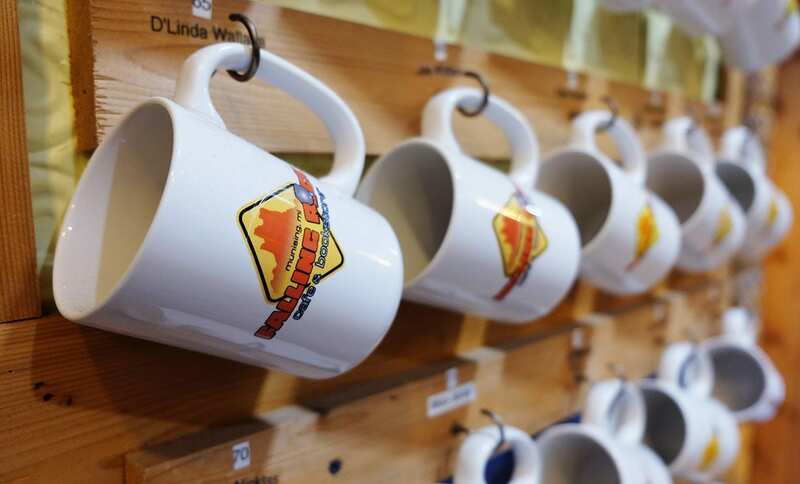 If you’re an entrepreneur in search of your dream business in Michigan’s beautiful UP, then the Falling Rock Café and Bookstore is a thriving Upper Peninsula coffee shop for sale with many opportunities to expand operations. We are a well-established brand known for community and customer service and are highly rated on TripAdvisor, Yelp, Facebook, Google, and other rating sites. This business, made up of its owners, staff and beautiful historic setting, is a leader in the community serving many charitable functions. It’s a favorite of locals and tourists alike, and we are affectionately known as “Munising’s Living Room”. Visit our Press Page to read what people are saying about us. The Falling Rock Café and Bookstore provides significant support for UP and Michigan artists, writers, musicians and small businesses. We experience a great deal of daily foot traffic during the busy season, and have a large and diverse customer base including locals, tourists, seasonal residents and passers-by. Our 2400 square foot map & mural on the east exterior wall of the building is a unique tourist attraction and we are a significant and reliable source of referrals to other local businesses, as well as a consistent source of information about area attractions. Annual Profit/Loss statements and tax returns reveal a financially successful and profitable business that provides many seasonal and year-round jobs and supports a number of other independent UP and Michigan businesses through the sale of art, books and other products. Buy the Falling Rock Café and Bookstore, along with the existing four rental apartments on the second floor of the building. Gross sales of the Falling Rock have increased annually since 2010, and the rental apartments have seen consistent 100% occupancy for the past 10 years. This listing, with growing sales, excellent staff, a 4,000 square foot historic building, and real estate opportunity, is ready to sell. Please contact us to see what makes this business and area so special. Upon signing a confidentiality agreement, we will be happy to have an initial discussion, answer your questions and discuss financials. Download a PDF brochure for more information. Great Lakes Coffee Company, Inc., (and DBA’s Lake Superior Coffee Company Inc., Lake Michigan Coffee Company, Inc., Lake Huron Coffee Company, Inc., Lake Ontario Coffee Company Inc., and Lake Erie Coffee Company Inc.,) is an affiliated company featuring exclusive roasts sold at the Falling Rock Cafe & Bookstore. The GLCC may be included in the sale, if desired.